Christmas will be here SOOOOOON! Ack! And as I am travelling shortly – and personally delivering gifts for my family – gift cards can be the easiest thing to get through TSA. 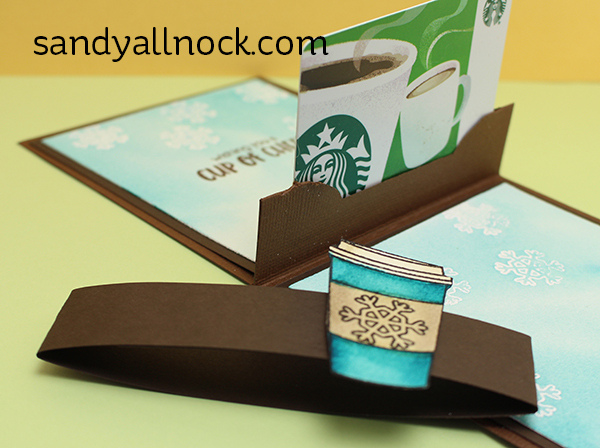 And these sweet cards can go through the mail easily too…they make a last-minute gift look well-planned! The coffee stamps here were sent to me by my friends at Sunny Studio Stamps. Before I get going – I didn’t come up with this myself! Lyssa Zwolanek is an SU demo (her blog post is HERE, video HERE) – and she’s one of many who shared a tutorial that is easy peasy. I made my own adaptations to it based on supplies I have, so be sure to adapt using what you’ve got too! Watch the video below or click HERE to see it in HD on YouTube. While I was making one, I went ahead and made two more in other colors. Cute huh? And so easy and fast! While I heat embossed the snowflakes, and watercolored the panels and layered them – feel free to just use some pretty patterned paper. That’ll make them even faster! Love this thanks for sharing. Love the little establishments on the belly band too! Love the tip on cutting the holder portion with a die. (I always just used the word window punch for these!) Nice to change it up! Also it never occurred to me to use the spray bottle to wet the WC paper before water colouring. I always just use a brush but find sometimes the water dries before I get there…DAH! Thanks for the tips. 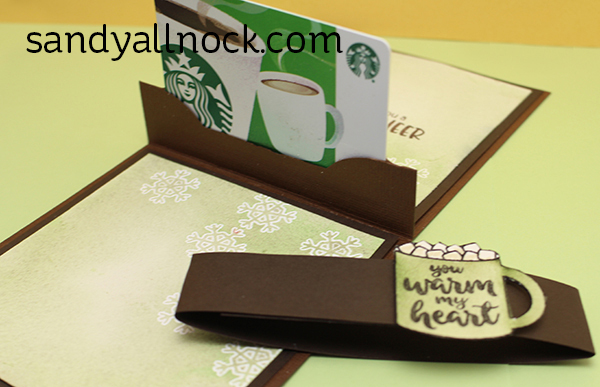 I’m always looking for ways to present gift cards, and this is super! Thanks. Great idea–thanks for the quick and easy video. Great idea, and as always, wonderful tutorial and video. Very fun! I have tow male bosses that I am giving coffee cards to, this will be the perfect presentation! Thanks Sandy – looks very easy to do. 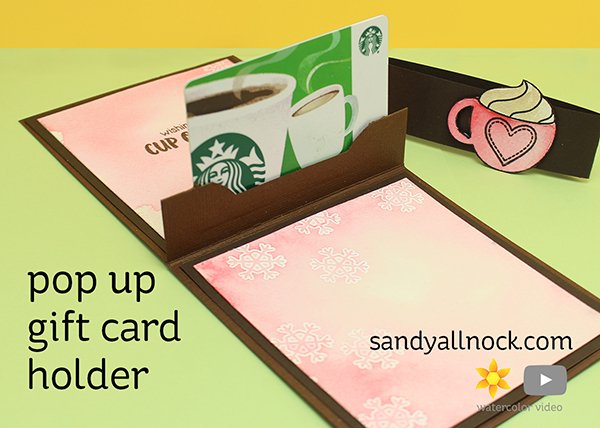 As gift card holders go, this is the quickest and easiest I’ve seen – thanks for YET another great idea! Great idea. I don’t give out many gift cards, but there is one person who always wants a gift card and this would be perfect and easy. I love this idea for gift cards! A perfect project for someone (me) that finds watercolor very intimidating.